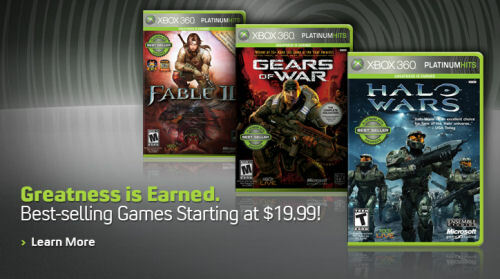 Three more co-op titles have landed on the XBox 360's Platinum Hits list: Fable 2, Gears of War, and Halo Wars. While we weren't too keen about the way co-op was handled in Fable 2, it was still a fun game in its own right and there may be some potential for a "save file tie-in" between Fable 2 and Fable 3. Halo Wars provides a very solid co-op RTS experience on the 360, with each player controlling their own troops but sharing the resources as they fight off the Covenant forces. As for Gears of War, it offers the same co-op experience as its successor, with a few great moments of its own. Each of these titles costs $29.99 so now may be a good time to use some of those lingering gift cards you got from Christmas. Halo Wars Previews and Impressions. We give the Lowdown on the Controls! Page created in 0.2494 seconds.